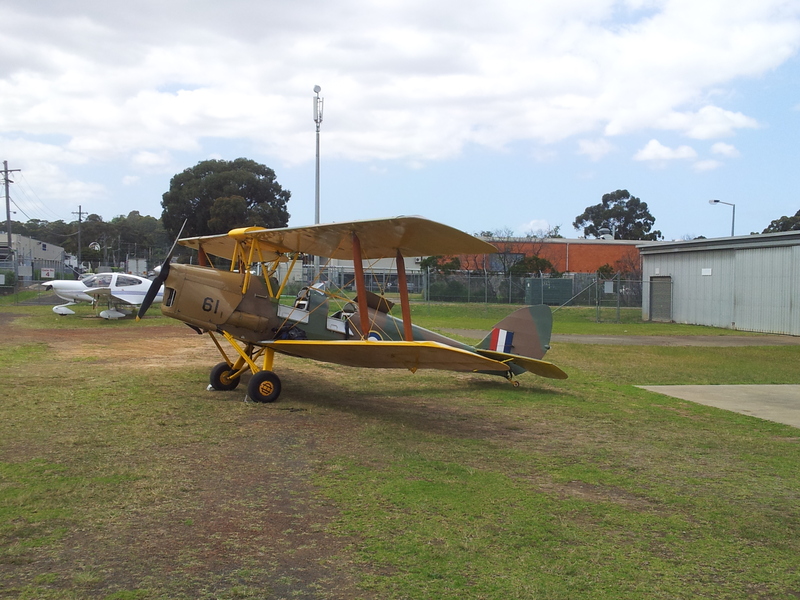 The ride was NFR (November Foxtrot Romeo), probably the aircraft I’ve spent the most time in now. I was expecting to do steep turns today, but that’s slated for tomorrow. 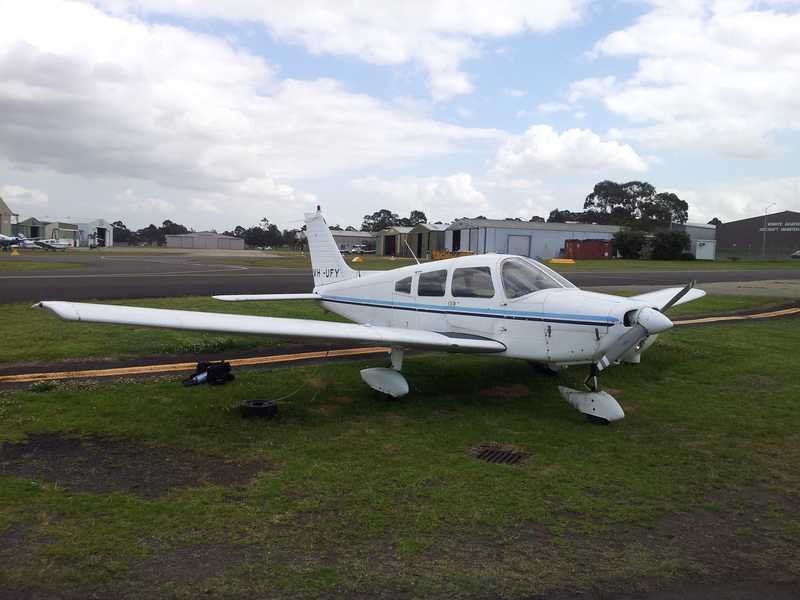 Today – for both lessons – we did (practise) forced landings. From a theory point of view, there’s an established body of knowledge and procedure around engine failure/forced landing situations. Some of this focuses around establishing “high key” and “low key” decision points at 2500 feet and 1500 feet AGL (above ground level). However, as John pointed out, in real forced landing situations – especially in the heat and stress of the moment – you won’t necessarily know the height of the ground below you and be able to calibrate the high key and low key decision points very accurately. More practically, John recommended that in forced landing situations I choose, preferably, a suitable landing place either to the left or right of the aircraft, that lies visually “under” the wing. In other words, a spot on the ground that you can be sure you can glide to. Failing suitable landing spots to the left or right, try a landing site ahead of the aircraft, or in the last option, behind the aircraft. So, in real (and simulated) engine failure/forced landing situations, it’s the usual mantra of Aviate-Navigate-Communicate. Aviate – Convert airspeed into height until you reach optimum glide speed (around 75 KIAS in a Warrior). Reach and maintain optimum glide speed. Select your target landing area, taking (quickly) into account a range of factors including wind speed and direction, size of site, slope of site, surface of site, obstacles and obstructions etc. Plan your approach, including contingency plans (eg. what if I can’t make it? what if I come in too high? too low?) 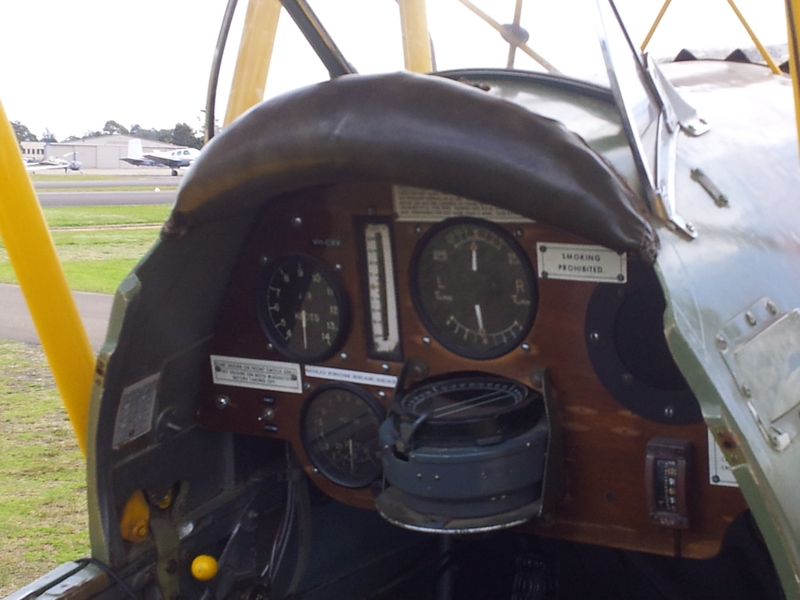 And, do a quick run-through of engine/fuel controls and system to see if the engine failure is fixable. (CMF – Carby heat on, Mixture full rich, Fuel pump on, switch fuel tanks). Navigate – Execute your forced landing approach as described above. Communicate – Squawk 7700 on your transponder, and make your Mayday call. Then if time remains and circumstances permit, do a more comprehensive check of engine and fuel systems – CFMOST. Carby heat on. Fuel pump on. Mixture full rich, including cycling mixture control through full rich-lean range and back. Oil – how are my oil pressure and temperature? Magneto switches – try switching just to the left magneto, then to the right, to see if the engine can run on just the one. And Throttle – cycle through full open-closed range and back. While this is all going on, of course, there may be passengers to take care of. Calm and reassure them (to the extent possible). Give them something to do – ask them to help by watching out for other air traffic. Instruct them to remove eyeglasses and pens/other objects from shirt pockets. From a glide approach point of view, part of planning your forced landing (and changing your plans as circumstances dictate) is how you’re going to get there and get down. Do you have enough height for a full circuit? Can you perhaps do only a straight-in final approach, or can you do a base and perhaps even a downwind leg? Do you have enough height that you can even do an upwind leg as well? Do you have to extend your glide a bit to lose height before the landing? Or do you need to cut things short and head straight for your landing site? At all events, can you glide to about 1/3 down your intended landing site? (When, and only when, confident of this last point, is the point at which you can use flaps to slow yourself down). In real situations, I think if you manage to do all of this, you’re doing well. Main priority, when all is said and done, is to get the aircraft down on the ground and walk away safely and without injury. 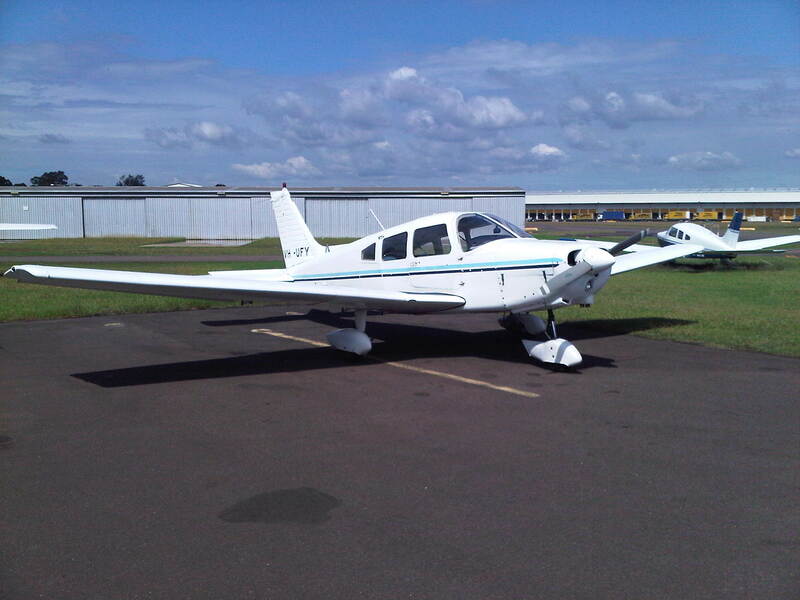 If the aircraft is undamaged, that’s a bonus, but lives and personal safety are priority #1. First, John demonstrated a forced landing approach to the little gravel strip out at St Mary’s. Easy as pie. Then back up to 3500 feet and it was my turn. I approached way too high and would have overshot the strip and not made it down. Next attempt from 2000 feet was better, I even pulled off a decent sideslip on my own (to lose height quickly) to get down and would have landed relatively safely. Next attempt I selected a reasonable landing site but lost site of it and therefore had to select an alternative which was nowhere near as good. And in any case, I’d made a poor choice of site given options available – I went for a site on the right hand side of the aircraft, where obstacles and some hilly ground abounded. There was better, more clear and flatter ground off to my left. Select your preferred forced landing site with care (within the constraints of circumstances and available time). A split-second decision like the one I made above (poorly) can mean the difference between a nearly “ideal” landing site and a much less ideal one. My final practise forced landing was pretty reasonable. I changed my choice of site 3 times on the way down – once because my preferred landing site had a fence running lengthwise straight down it – but my final site was quite good and I would have got down OK. If anything it showed me that a decision you make at 3500 feet may have to change once you get lower and can see more features on the ground. Departure procedures from Bankstown – maintain 1000 feet (or 1500 depending on takeoff direction) until over the railway tracks. Then up to (say) 2300 feet (no higher than 2500 feet as that is lower boundary of surrounding Class C airspace). Then up to (say) 4000 feet once over a line intersecting Tadpole Lake to the north and 3 Lakes to the south (again, no higher than 4500 feet due lower limits of Class C airspace). Radio and transponder procedures. Once abeam of Prospect Reservoir, switch radio to 124.55 (Sydney Radar) and transponder to 1200. Inbound approach procedures (reporting in at Prospect or 2RN, and joining traffic pattern for landing at Bankstown). So, tomorrow (as usual, weather permitting) we will do our lesson on Steep Turns, with a little Incipient Spins drill thrown in. And in the afternoon I’ll do my pre-Training Area Solo theory exam. Friday I’ve got a checkride scheduled with Ashley (from my First Solo checkride) so he can verify I’m ready for my Training Area solo. Then, perhaps Monday (or Sunday, if I schedule it?) my Training Area Solo, which I’m really looking forward to. The aircraft all to myself, just me, away from the airport for the first time! Very much looking forward to this. OK, not an awful lesson. In fact not a bad one. But a really great one for reminding me of the dangers of complacency, and also with a salutary lesson about coming to a full stop on runways. We’d wanted to get a 2nd lesson on stalls in today, but weather just too marginal, so as with this morning we stayed in the circuit, in which I’ve now clocked up 10 hours! In preparation for my pre-solo checkride with a more senior instructor (scheduled for tomorrow), John threw in a series of simulated engine failures as he knows the instructor tomorrow will want me to handle these. Apart from the first simulation – which was an engine failure on late downwind and on which I failed to immediately initiate a glide approach to the runway – the engine failure stuff was all good. A couple of simulated engine failures on climb-out and on crosswind went well. Despite failing to initiate the glide on the first time around, we did 2 glide approaches to the runway and I handled these pretty well. Oddly enough, my best landings seem to happen when I’m gliding the aircraft in! The other stuff was OK, although the last 2 landings very damn scratchy indeed. On the 2nd last landing I approached too fast and too high, resulting in me landing skewed on the runway and requiring immediate work on the pedals from my instructor to control the nosewheel properly. For some reason I’d been reluctant to immediately correct my direction on the runway using the pedals, thinking I might somehow damage the nosewheel assembly? Not sure. Anyway, instructor simply asked me where my feet had been – they should have been on the pedals from the get-go, firmly correcting the direction of the aircraft. If you land with your nose not properly aligned with the runway direction, use your feet and pedals immediately to correct the aircraft’s direction and get it back in alignment with the runway centre line. And the last landing was pretty ordinary as well. I forgot my learning from Day 11 Lesson 13 about not letting the airspeed go too low on finals. So I applied heaps of power on late final, managed not to balloon too much but took ages to get down on the ground, and in my haste to exit the runway I braked too hard and nearly lost control of the aircraft! Instructor intervention again required. I think I was still smarting from the crap previous landing plus the one I’d just done and let the pressure get the better of me. What would have been far better would have been to ease off and use the next left exit off the runway. I had plenty of runway remaining, I still had a fair bit of speed and would have reached the exit quickly enough to avoid disrupting any traffic behind me. On landing roll, avoid applying brakes so heavily that you risk locking them up and losing control of your aircraft. If you can’t safely turn for an earlier runway exit, take the next one down. You’re on the runway, you’ve got right of way, so don’t be in such a hurry that you take risks. Don’t dawdle, but by the same token, don’t let haste make things unsafe. Apart from the above John was pretty complimentary about the lesson. I just don’t want to repeat the above ever, let alone in my pre-solo checkride tomorrow (weather permitting). Ah well. It’s all good learning.